Byond Tech Electronics Pvt. Ltd, an Indian mobile brand, has launched the Byond Phablet PI with a 5.3 inch touchscreen display after successfully launching Byond Phablet PIII with 6 inch screen and Phablet PII with a 5.7 inch screen. The Phablet will be coming with the Multi Purpose screen feature. With the Multi Window screen option you can surf more than one application at a time with the multi window option and it lets you use the phone for multiple purposes making your phablet experience more useful and faster. Samsung was the first Smartphone Company to release Multi Window screen in its Smartphones like Samsung Galaxy Grand, Galaxy S4 and other where after many Smartphones and Tablets received an Android update featuring of this Interface. But Beyond, being an Indian company is now coming with this innovative feature in its Phablet PI which is impressive. The Byond Phablet PI comes with a 5.3 inch IPS capacitive touch screen display with qHD resolution of 540 x 960 pixels with the body dimension of 150X78.6X9.7mm, weighting 188 grams. 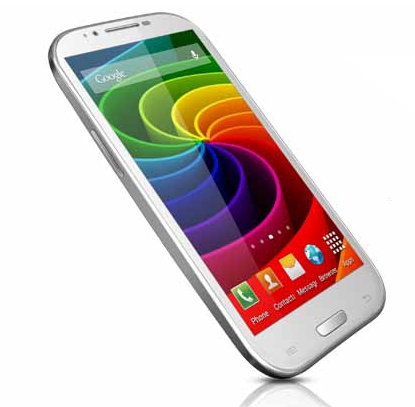 This Dual-SIM device will be operating on Android 4.1.1 Jelly Bean OS. It is powered by a 1GHz dual core processor with 1GB RAM and have 4GB of internal storage which can be further expandable up to 32GB with MicroSD card as per the need. The Phablet is featured with as auto focus 8MP rear camera with LED flash and a 1.3 MP front facing camera for video chating. The device also offers software functions such as Flash mode, Scene mode, Panorama and continuous shot mode. The basic connectivity options include 3G, Wi-Fi, GPS, Bluetooth and micro USB. The device will be supported by a battery of 2000 mAh which could easily last for over a day on a single charge. It also support a G-Sensor, light and proximity sensors. Display Size: 5.3 inch IPS capacitive touch screen display with qHD resolution of 540 x 960. Connectivity: 3G(7.2 Mbps), 2G, Wi-Fi, GPS, Bluetooth, 3.5mm jack, micro USB port and support G-Sensor, light and proximity sensors. It would be available in White and Navy Blue colors options and comes with a free Flip Cover and a Screen Guard. The price of Rs. 10,999 seems good enough for a dual core handset with a 5.3 inch screen, however there are few options available for this price tag with somewhat same feature. Even some better options are available to choose from, for example the Zen Mobile 701HD which will be coming with a quad core processor for just for Rs. 11,999, Rs 1,000 more than Byond Phablet PI. Still the device is expected to create a good competition in the market , especially with the multi window Screen feature.